Since its establishment, Liangjiang New Area has promoted all tasks and services relating to the building of Jiangbeizui CBD and the introduction of various financial institutions. At present, Jiangbeizui core financial area has an embryonic form, with many financial institutions - including Huaxia Bank, PICC Life Insurance and China Development Bank – opening branches and representative offices in Liangjiang. In addition, many Fortune 500 companies, central government-owned companies and industry leaders - such as Banque Populaire, Alibaba Group and Suning Group – are also represented in Liangjiang. The National Pharmaceutical & Machinery and China International Pharmaceutical & Machinery Expo was held in Chongqing International Expo Center of Yuelai Convention & Exhibition City in Liangjiang New Area from October 26 - 29, 2013. This was the first national exhibition in Chongqing International Expo Center and the first national exhibition covering over 100,000 square meters to be held in Chongqing. The success of this exhibition has helped to establish a professional image for Yuelai Convention & Exhibition City and increase the recognition and reputation of Chongqing's exhibitions. There are a total of 16 pavilions in the southern and northern regions of Yuelai International Expo Center, where 12 large-scale exhibitions - including China Chongqing International Investment and Global Souring Fair and Chongqing International Auto Industry Fair - were held, with a total exhibition area of 543,000 square meters and a record of over 1,400,000 visitor arrivals. The 12 docks in Guoyuan Inland Port Phase 2 and its Expansion Project started operation in November 2013. Before these 12 docks, Guoyuan Inland Port Phase 1, Phase 2 and Expansion Project registered a cargo capacity of 30 million tons. By 2014, when Guoyuan Inland Port will be connected with the Chongqing-Xinjiang-Europe railway, mass freight will also be transported to Europe via Guoyuan Port. In addition, Liangjiang New Area is building a logistics platform integrating water port (including Guoyuan Inland Port and Cuntan Inland Port), land port and air port, to radiate domestic and overseas regions, with the aim of becoming an inland open center. The logistics park in Longxing Park of Liangjiang New Area, with a US$80 million investment from Vailog - the largest logistics and warehouse facilities provider in Italy - has been launched. Since the opening of Chongqing Bonded Commodity Display and Trading Center located in the Bonded Port Area, more than 2,000 imported commodities, including red wine, food, cosmetics, household items and limousines, have become popular with residents of Chongqing. Trade: The chief support of the service industry in Liangjiang New Area. 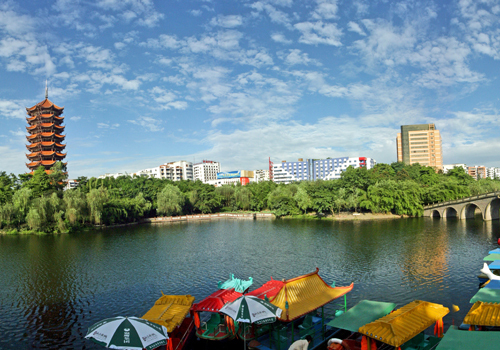 Thanks to the establishment of multi-level distribution systems, the development of specialized markets and the introduction of a large number of leading enterprises in recent years, the traditional trade industry experienced rapid expansion and has become the chief support of the service industry in Liangjiang New Area - and this industry has entered into the maturation stage with a moderate growth rate.